The Pediatric Brain Tumor Foundation has produced a series of educational videos to help families better advocate for their child during treatment and beyond. 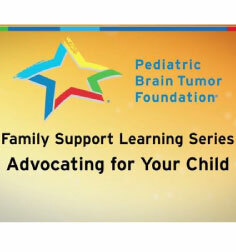 The Family Support Learning Series features brief interviews with leading brain tumor experts. The clips explain complicated subject matter in simple terms. Recordings of our Parents & Survivors Conference sessions include presentations on a variety of subjects, from nutrition to genomic testing. Overview of Childhood Brain Tumors: Carol Kruchko, Central Brain Tumor Registry of the U.S.